Jesus set out and went away to the region of Tyre. He entered a house and did not want anyone to know he was there. Yet he could not escape notice, but a woman whose little daughter had an unclean spirit immediately heard about him, and she came and bowed down at his feet. Now the woman was a Gentile, of Syrophoenician origin. She begged him to cast the demon out of her daughter. He said to her, “Let the children be fed first, for it is not fair to take the children’s food and throw it to the dogs.” But she answered him, “Sir, even the dogs under the table eat the children’s crumbs.” Then he said to her, “For saying that, you may go– the demon has left your daughter.” So she went home, found the child lying on the bed, and the demon gone. Then he returned from the region of Tyre, and went by way of Sidon towards the Sea of Galilee, in the region of the Decapolis. They brought to him a deaf man who had an impediment in his speech; and they begged him to lay his hand on him. He took him aside in private, away from the crowd, and put his fingers into his ears, and he spat and touched his tongue. Then looking up to heaven, he sighed and said to him, “Ephphatha,” that is, “Be opened.” And immediately his ears were opened, his tongue was released, and he spoke plainly. Then Jesus ordered them to tell no one; but the more he ordered them, the more zealously they proclaimed it. They were astounded beyond measure, saying, “He has done everything well; he even makes the deaf to hear and the mute to speak.” Mark 7:24-37. 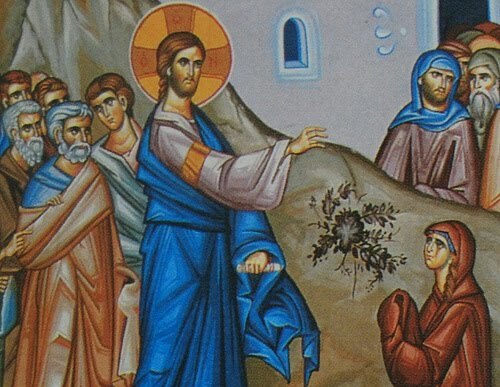 In today’s lectionary readings from Mark’s Gospel, we find a number of challenges. In the first passage, on our initial reading, Jesus seems a bit stingy, argumentative, and a little off His game. A few years ago, reading this passage, I was struck by the idea that it seemed like Jesus had to be coaxed into being charitable. At first, we may wonder if this is the same Jesus we know. I want to suggest that this passage presents exactly the Jesus we know. We should begin with the observation that this first passage contains a number of unusual characteristics. First, it’s located in Tyre, which is not an ordinary place for Jesus to be roaming around. That’s Gentile country, and no place for a good Jewish boy to be. Secondly, he’s approached by a Syrophoenecian woman. At that time, it would be unusual for any woman to approach a Jewish rabbi, let alone a Gentile woman. (Further, the identification of this woman as “pheonician” implies an association with the Canaanites. In fact, Matthew’s Gospel describes this woman as a Canaanite.) Unlike many of the Gospel stories, in this story Jesus’ disciples (his regular companions) are absent. Finally, her daughter has a demon, and so we know we’re encountering a spiritual battle here. I think part of the answer lies in the original Greek text. When the woman comes and asks Jesus to cast the demon from her “little daughter” (thygatrion in Greek), He replies that the children should be fed first before the “little dogs” (kynariois). In one sense, I think we can read this story, picturing Jesus with a twinkle in his eye as He draws from this woman an affirmation of the faith which He knew was present in her. In another sense, I think St. Mark uses this story to contrast Jesus with the Jewish authorities of the day, who would certainly have rejected this woman and her concerns. Mark uses this as a narrative device. It’s worth noting that Jesus doesn’t tell the woman “no”; rather, he says, “not yet.” I don’t think Mark uses this story to portray Jesus as ambivalent or wishy-washy on the subject of ministering to the Gentiles. Rather, I think he’s telling this story to portray the difference between Jesus and the religious authorities of His day. Jesus expels the demon from this woman’s child “because of this reasoning” (dia touton ton logon). We therefore ask, what was it that she said? She told Jesus that even the crumbs He had to offer would suffice to heal her daughter. We hear an echo of this in the old 1928 Book of Common Prayer, and I’m not so sure we shouldn’t still be praying this: “We are not worthy so much as to gather up the crumbs under Thy table.” From this Gentile woman we hear a remarkable affirmation of trust, of need, and of faith. Mark’s second story similarly challenges the traditional notion of holiness of that time. Jesus travels toward the region of the ten cities (the Decapolis). Again, He remains deep in the territory of the Gentiles. The crowd brings a deaf man with a speech impediment to Jesus. Jesus’ offers a deeply intimate act of healing this man. He thrusts his hands into the man’s ears, spits and then touches the man’s tongue. These things would have clearly violated the purity codes of that time, which viewed saliva as unclean. The passage rings with the echo of Isaiah’s promise: “Then the eyes of the blind shall be opened, and the ears of the deaf unstopped….” Isaiah 35:5-6. In one sense, it’s the deaf man’s ears that are opened. In other sense, it’s the Gentile woman who is opened to the ministry of Jesus. Viewed in another light, it’s about Jesus being open to the pain of the world. In yet another sense, it’s the entire world (and not just the people of Israel) to whom Jesus opens a new way of holiness. I pray that we will be open to his healing ministry as well. This entry was posted in Uncategorized and tagged Anglican, Bible, Disciple, Bible, Charity, Christianity, Dominican Order, Episcopalian, Gospel of Mark, Jesus, Mark 7:24-37, Pastoral Care, Religion, Scripture, Spirituality, Theology. Bookmark the permalink. It is a difficult passage, Noel. And this reading is just one way to look at it. I join you in that prayer, Brother James. May we be open to what God is doing among us here and now. I hope we will, Ron. Our openness launches a world of awe and wonder. I believe that the Lord always had reasons for everything He said and did, and often there were multiple meanings to one statement or action. Jesus was always thinking of the timing and order of things, because He was focused on His mission and the short time He had on Earth to accomplish it. For instance, He didn’t want His healing power spread abroad because He still needed to bring the gospel to other regions, and the crowds really slowed Him down. My study of this passage about the woman indicated that it was not an insult to the Gentile woman and she knew this. He was still busy with the lost sheep of the house of Israel. But as you say, He tested her faith and her humility. I love the fact that Jesus groaned when he began to pray about the man who couldn’t speak or hear. I think Jesus’ capacity to not only see, but to experience our suffering marked Him as the Son of God. Your blog is a wonderful ministry! Thanks so much for the reference, and your comments. Frankly, I have good material to work with. This post helped me look at this scripture in a new way. I’m glad you found it useful, SM. Thanks so much for the re-blog. An enlightening reading, although my Greek isn’t up to much so I’ll have to have a little faith! Mine is not nearly as good as I wish it were. I’d love time to study Greek, but that’s not happening anytime soon, so I mostly rely on secondary sources.